One of the ten largest churches in the world, the National Shrine has received many distinguished guests throughout its almost century-long history. Among these visitors were two of our era’s most vibrant saints: Pope John Paul II and Blessed Mother Teresa. During their lifetimes, both figureheads of modern Catholicism developed a close affiliation with the Shrine through many visits and acknowledgements. 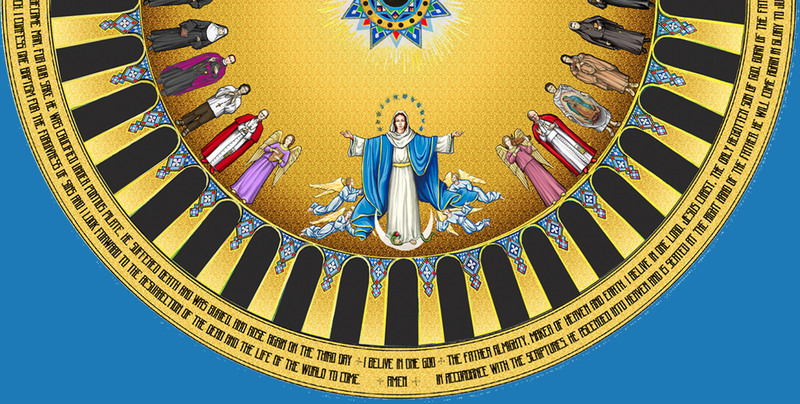 Thus, it is no surprise that they were selected to grace the Trinity Dome mosaic. Cardinal Karol Wojtyla, Archbishop of Krakow, Poland, visited the National Shrine—first in 1969, then again in 1976. Cardinal Wojtyla would become Pope John Paul II in 1978. In 1979, he would return to the National Shrine as the first-ever reigning pope to visit. In 1990, Pope John Paul II elevated the National Shrine to the status of a minor basilica, bestowing this papal honor for its historical importance, dignity and significance as a center of worship and devotion, and as an expression of a special union with the Holy Father. Mother Teresa: Bringing Her Mission to Washington D.C.
A close friend to Pope John Paul II, Mother Teresa was another beloved and world-renowned saint who visited the Basilica of the National Shrine of the Immaculate Conception during her lifetime. Her first visit was in 1972. Frequent visits followed for more than two decades, oftentimes for the solemn profession of her Missionaries of Charity, the congregation she founded to serve the poorest of the poor around the world, to include Washington, DC. Mother Teresa will always hold a special place in the heart of the National Shrine, figuratively and quite literally, considering that a heroic-sized statue of this little nun that has stood in the Basilica’s “Hall of American Saints” since its dedication in 2009. Soon, her life will be reflected in one of the largest mosaics in the world, the Trinity Dome. Not only did Pope John Paul II and Mother Teresa have unique connections with the Basilica, but they both served our country, and more specifically, arising generation. They left a legacy of love particularly to the youth of America, encouraging them to stand strong in their beliefs and serve each other selflessly. Their beautiful contribution to the United States and to the world continues to this day and, thus, these saints will be forever enshrined at Mary’s Shrine.